HANAMI II: des récits mais aussi des trucs à savoir pour les OVNIs: Some questions about rigging / Quelques questions sur le grément. Some questions about rigging / Quelques questions sur le grément. Un nouvel OVNIste américain, celui qui va maintenant être l'heureux propriétaire/skipper de TiTésor dont je parlais dans un post précédent m'a posé quelques questions sur le choix fait pour Hanami II d'avoir un Solent plutôt qu'une trinquette conventionnelle. C'est une question que l'on me pose fréquement et j'ai donc décidé de mettre la réponse dans le blog, pensant qu'elle pourrait être utile à d'autres mais surtout que, bien qu'elle soit en anglais (j'ai la flegme de traduire), elle génèrera des commentaires que tous pourront partager. I am sur you will enjoy the 365, it is one of the best Alubat OVNIs. TiTresor was my neighbour for years and I know her well. A conventional Genoa with a furler. A Solent and not a stay-sail with a furler. A Genaker (100 m2) with a furler. I choose the Solent instead of the Stay-Sail for several reasons listed below. 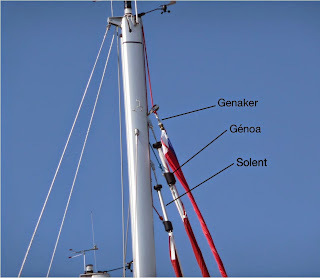 1 -The forestay goes up almost to the top of mast, just below the Genoa’s one. This is much higher than the second spreaders. 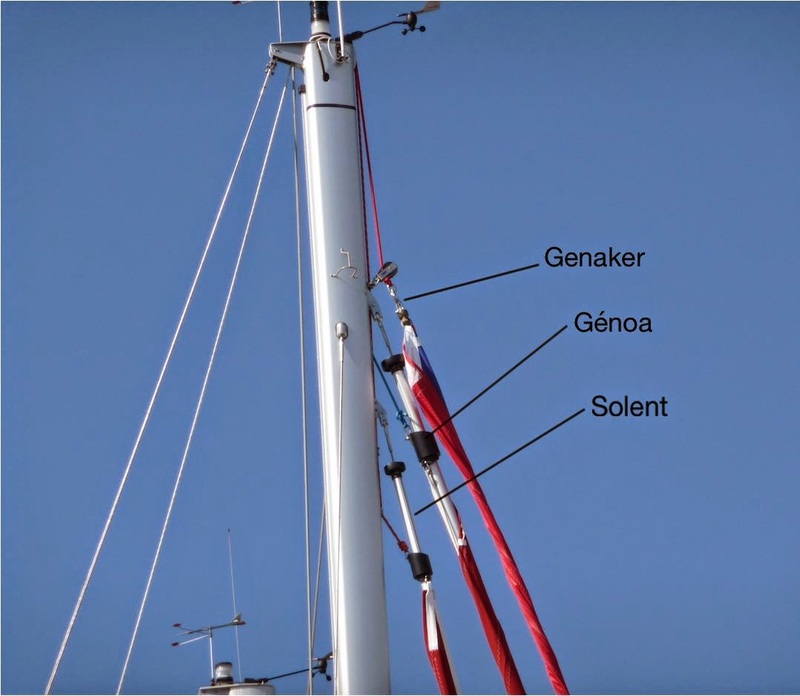 2- As the Forestay is high, it doesn’t require using running backstays because the pull is not in the middle of the mast. Nevertheless I have the running backstays in a locker in case I want to use a strom gib with a forestay fixed at the Second spreaders level. 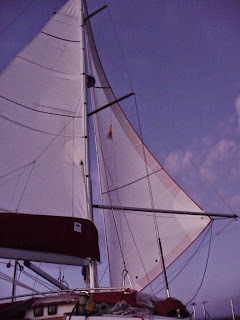 3 - Having a forestay that goes up the mast gives me a backup in case of breaking my Genoa forestay. That was a very imortant decision criteria. 4 -It makes very easy to sail with the front sails goose winged. In this configuration the wind escapes between the 2 forestays and it keeps the boat very stable. It is the same if you sail with the Ganaler downwind and the Genoa or the Solent polled out up wind. You get the same pull you would have with a symetrical spinaker but it is much easier to handle and much safer too. 5 - When poled out on a fixed pole the canvas area is much more important than with a Stay-Sail but you can still adjust vey easily. 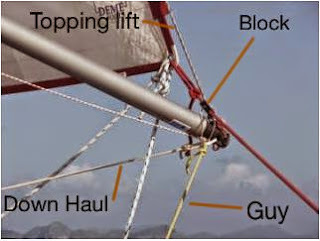 When we pole-out the head sail the pole is fixed by its topping lift, the downhaul and a guy that goes back to a cleat at the rear of the boat. At the end of the pole is an openning block in which goes the sheet. In fact ther are 2 sheets: one that goes through the block and the othet one through the convebtional route, just in case you have to ‘un-pole’ quickly. 6 - When sailing windward with more than 15 to 20 knts of wind I always use the Solent. The sail is much flatter, the push/pull point is much backward and the boats gets less heeling. Aditionally it makes very easy to tack without having to furl parly the sail as it would be the case with the Genoa. 8 - If you sail in the Pacific you can use a Yankee instead of a Génoa and have the Solent too, which is something I haven’t done so far but which, according to Jimmy Cornell who gave me the trick, is a very good and effective sails configuration. Well, those are the benefits but there are a few down-sides. 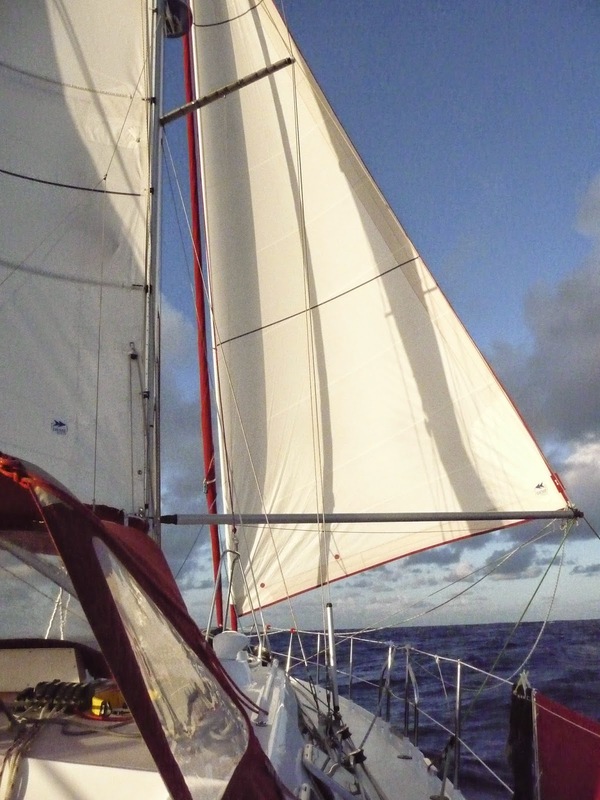 1 - If the wind is very strong it is larger than a stay sail, hence you have to roll it a bit. 2 - It is also larger than a Storm Gib, hence you may want to have one of those which will require a specific forestay hooked at the second spreader's level. 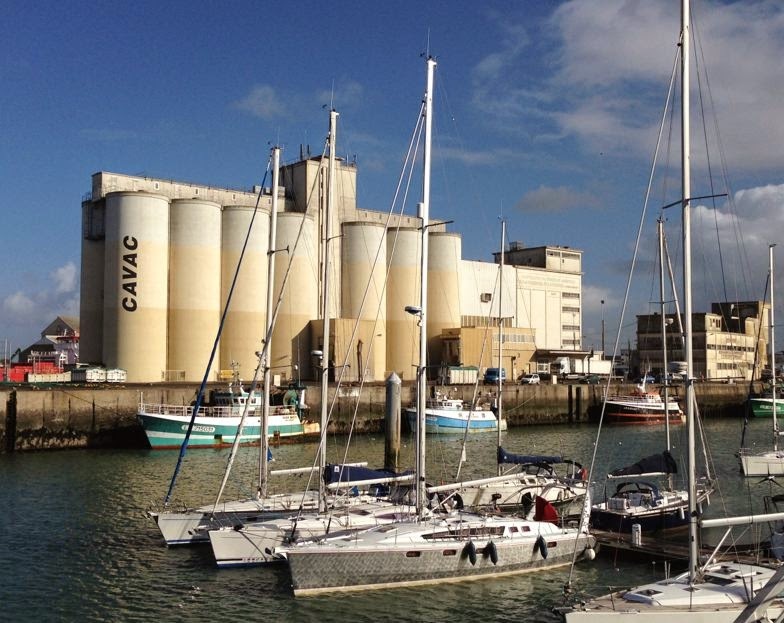 The mast has the fixation point so it should not be a big issue for the mast. 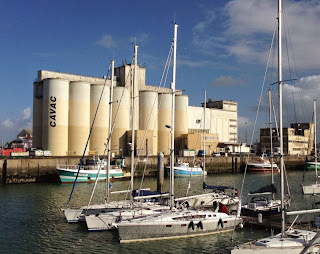 At the deck level you may require a specifiv U-Bolt or use a textile-forestay with a tackle hooked on the Solent U-Bolt and keep the Storm Gib hanked on it whilst stored in its bag at the bottom of the mast. This topic has been discussed previously in the blog and here is the link. Obviously, that is not a lot and for me the benfit is obvious. 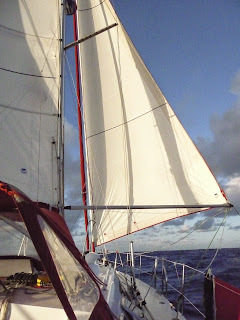 During two time 5 months in the Carribeans, where the wind is alway between 20 and 25 knts, and coming from abeam when you are not sailing windward, we always used the Solent with a reefed Main Sail (1 reef). It keeps the boat stable minimise the heeling hence more confortable and to some degree faster. I hope I did answser your questions. To use a Genaker or or Spinaker (symétrical or not) you will need a bowsprit and Alubat has one that fits perfectly. On the topic of poled out head sails, there is a very good paper in the January issue of Yachting Montly: worth reading. And there is a video clip too, we had on the blog in January, here it is.